American Wolf: Endless Summaries: The Beach Boys Compilation Problem. Endless Summaries: The Beach Boys Compilation Problem. In mid-1974, just as America was reaching its modern emotional nadir with the Watergate Scandal & President Richard Nixon's subsequent resignation, Capitol Records released a compilation called Endless Summer by The Beach Boys—a group so out of fashion that their previous release had been a reissue single of "All Summer Long" backed by "Surfin' Safari," in an attempt to capitalize on its use in that great bastion of by-gone American culture, American Graffiti. Although The Beach Boys had released various best-of compilations over the years, Endless Summer was the one that broke the mold. It became the surprise blockbuster of 1974 & remains for many people THE Beach Boys collection, if not statement. Surprisingly, it was only the second Beach Boys' LP to hit #1—the first was their obligatory mid-'60s live album (& no, Pet Sounds never came close as it stalled at #10, although it did make #2 in the UK, but I digress)—& introduced an entire generation to the group, the very same people who ushered in their "America's Greatest Band" phase by the time they were rocking out for the Reagan White House on the 4th of July, which is about as American as a show can get, I'd say. For this reason, people get pretty misty-eyed about Endless Summer, but upon closer examination nearly 40 years after the fact, the album reveals itself to be the slapdash afterthought it truly was. Basically, by 1974, The Beach Boys had left Capitol to start their own Brothers label (& unknowingly enter their bizarre "cult" years between hit-makers & oldies-circuiters), & Capitol was looking to make a cheap buck off the band. 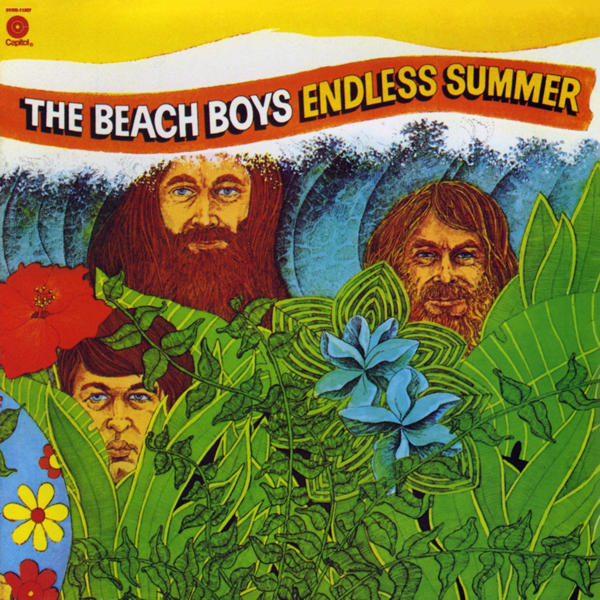 As you read everywhere, Endless Summer was made with the help of Mike Love (which, depending on if yer Team Brian, means that it was soiled by the hand of satan, or if yer Team Mike, it was graced by the great unsung hero of American popular music), which means he chose to focus on the Beach Boys' vintage years (1962-1965) to the exclusion of anything later — i.e., Pet Sounds &amp; the #1 "Good Vibrations" (although we will soon see the latter oversight rectified). It was this emphasis that made it so irresistible to the kids, as the post-'60s purple haze of glass onions & jewels & binoculars hanging from the head of the mule had overtaken the (often great) music that had come just before it. Enter Endless Summer, which, say what you will about the music (& I will), came in a shiny double-set with lovely artwork—evocative line drawings of the boys among the green trees & yellow sand of the beach, which were a perfect match for the mood of the music inside, while oddly also being a perfect mismatch for the time in which the music was made (despite the fact that all of the recordings were around a decade old & made in their classic preppy matching-striped shirt days, the band was drawn with the long hair & flowing beards that was contemporary to 1974) — & perfect title. Endless Summer. Yes. If there's a more perfect comp title, I've yet to see it. OK, maybe the Flaming Lips' Finally The Punk Rockers Are Taking Acid, but that's more of an intellectual perfection where as Endless Summer works completely on mood. Which is what this album is all about. For everything that is on the album, it's interesting to note what isn't. A handful of big hits are all MIA—"When I Grow Up (To Be A Man)" (#9), "Dance, Dance, Dance" (#8), "Do You Wanna Dance?" (#12), & "Barbara Ann" (#2)—despite the fact that they were all released during the 1962-1965 time period. Also, minor hits & classics like "409" (#76), "Please Let Me Wonder" (#52), "The Little Girl I Once Knew" (#20), & "Little Honda" (the lead song on an EP that hit #44) are also missing. & then, most sacrilege of all, on 3 tracks the less-familiar & inferior LP versions were substituted for the famous hit versions: "Be True to Your School" (#6), "Fun, Fun, Fun" (#5), & "Help Me, Rhonda" (one of the Beach Boys' few #1 hits). This has always struck me as very fishy. & with everyone agreeing on how thrown-together this compilation was, it's always just felt like some engineer somewhere wasn't really paying attention when they sent the masters to be pressed, & then it wasn't worth fixing once they had been sent, if anyone even noticed in the first place. & then when it becomes a #1 smash, why fix something that's not broken? So that's already five Top 40 hits from the period that was left off, plus an additional three Top 10 hits that weren't included in their hit versions. Really, who was in charge here? But what did make it on, wrong versions & all, play majestically. In this regard, Endless Summer plays the ultimate trick of them all: Feeling like the perfect summation of The Beach Boys, even if reality proved otherwise. For everything that the album wasn't, it was assembled shrewdly. It balances between rockers & ballads, with the opening side of "Surfin' Safari" (#14) "Surfer Girl" (#7), "Catch A Wave," "The Warmth Of The Sun," & "Surfin' USA" (#3) especially perfect. The big hits—"Little Deuce Coupe" (#15) "I Get Around" (#1) "California Girls" (#3)—are pretty evenly divided among the smaller ones—"In My Room" (#23), "Shut Down"(#23), & "Don't Worry Baby" (#24)—& the non-charting classics (at least in the relative world of the Beach Boys) like "You're So Good To Me," & "All Summer Long." The few other filler tracks—"The Girls On The Beach," "Girl Don't Tell Me" & "Let Him Run Wild"—can be excused as filler, given the fact that you are getting a 20-song, double album. But wait just a minute there—only one song breaks the 3-minute barrier (the inferior version of "Rhonda"), while two don't even break the two-minute barrier, resulting in a breezy album that runs a little over 45 minutes. That's shorter than the Beatles' Abbey Road, Bob Dylan's Highway 61 Revisited, & the Rolling Stones' original UK version of Aftermath, all of which sit comfortably on a single disc. Indeed, while the average LP side can hold around 20-23 minutes, Endless Summer opts for around 12 on each of its side. Thus, it could've been issued on a single LP — which, incidentally, is exactly how it was issued in the always-thrifty UK. But Americans are all about space & a double-album feels fuller than a single, & this is an album all about feel. Also, as any business undergrad can tell you, a double-album can be sold at a higher price. With the CD Endless Summer now neatly skipping Pet Sounds, it remained the optimal recommendation for many critics, just as the 2 albums appear in Rolling Stone's 200 Essential Albums list in 1997. Unlike so many other artists, these albums seemed to fit together perfectly, with Endless Summer leading just up to Pet Sounds, Pet Sounds filling its own void, then the bonus track of "Good Vibrations" (released after Pet Sounds) to finish the story with seemingly everything you need to know. Now, assuming we can call the 3 "wrong tracks" issued resolved given that they were (finally) corrected, I still don't understand how some of those songs made it on the album. Maybe I'm quibbling here (OK, I'm definitely quibbling here), but I can't believe that legitimate Top 10 hits like "Dance, Dance, Dance," "When I Grow Up (To Be A Man)," & "Barbara Ann" were MIA while second-rate, derivative fodder like "Girls On The Beach," "Girl Don't Tell Me," & "You're So Good To Me" made the cut. It is probably for these very reasons (plus I don't think the sound was ever remastered for the non-gold CD edition) that Endless Summer has remained out of print for at least a decade now (at least as a hard-copy; you can still download it—3 wrong songs & all—on iTunes). But what kills me most is that nothing worthy of its vision was put in its place. Before Endless Summer appeared, there was the old vinyl Best Of The Beach Boys, Volumes 1 & 2 that have been out of print longer than I've been alive. Just as well since, despite Greil Marcus's claim about the second volume, they both seem to skimp on length (as many LPs did back then) & add some needless junk amongst the hits (namely, The Beach Boys trying to beat the Kinks in the contest for the worst "Louie, Louie" cover on Vol. 1 & something called "Long Tall Texan" on Vol. 2). Sometimes there's a reason things are outta print. Hot off the hit (in the box set world, anyway) collection, it was time to make a new, definitive CD of the Beach Boys hits, especially since they now had their fourth #1 hit! But instead, they made The Greatest Hits — Volume 1: 20 Good Vibrations. Issued in 1995, the album was the exact opposite of Endless Summer: With a corporate title & an ugly cover, it looked like the perfect summation of the Beach Boys' career, but had none of the feel. At only 20 songs, it still only ran for about 50 minutes, meaning that another half hour of hits could've been added. & also—clearly some misty-eyed Endless Summer-ers were at the helm here—they substituted the stupid versions of "Be True To Your School" & "Help Me, Rhonda" for the hit versions. Now they had no excuse. Which is probably why only 4 years later, they weirdly reissued the album with the same name & title, but with a different (now chronological) running order & the actual hit versions of "School" & "Rhonda." But still at only 20 tracks, it feels a bit skimpy, not to mention MIAs like "Don't Worry Baby" & "When I Grow Up (To Be A Man)" (does everybody really hate that song THAT much? ), plus the awkward fact that there's a good 22 year gap between the 19th & the 20th songs ("Good Vibrations" & "Kokomo," respectively, natch). The Greatest Hits — Volume 2: 20 More Good Vibrations filled in the cracks, but it definitely felt like leftovers, with the sputtering ballad start of "In My Room," "The Warmth Of The Sun," & "Don't Worry Baby," all excellent songs, but not the best way to start an album—& once you get to lesser-hits like "The Little Girl I Once Knew" & non-hits like "You're So Good To Me," it's clear that the real party lies elsewhere. By the time they put out the third volume, of their cultish "Brothers" years (which killed a potentially great idea by including weak minor-hit singles like "California Saga" over stunning album cuts like "This Whole World" & "Forever"), I'm not sure if anyone was paying attention anymore. Except me, apparently. Don't get me wrong, the Beach Boys did have some surprisingly respectable hits since "Do It Again," with 1969's "I Can Hear Music" (#24), 1976's "Rock and Roll Music" (#5, not sure how, but it was), & the aforementioned "Kokomo"; not to mention the minor hits between "Heroes & Villains" & "Do It Again"—namely, 1968's "Wild Honey" (#31) & "Darlin'" (#19). But basically, anything more than these songs feels a bit over-inflated, which is exactly how tracks like 1978's "Come Go With Me" (#18) & 1979's "Good Timin'" (#40) are left in the mix, while other songs—most disgracefully, for me anyway, "409" & "Catch A Wave"—are left off. It wasn't until recently that I realized the 30 songs on Sounds Of Summer was the first place to gather all of The Beach Boys' Top 40 hits in one place, minus 2—the always-a-bridesmaid "The Little Girl I Once Knew" (#20 in 1965) & the forgettable "It's OK" (#29 in 1976). Hence no "409" (which only made #76 as the B-side to "Surfin' Safari") nor "Catch A Wave" (which was never released as a single in the first place. These songs, along with "The Little Girl I Once Knew" & "It's OK" were gathered on the obligatory "leftovers" album Warmth Of The Sun, which was interesting for its own purposes as an alternative history of the group, but suffered from the same problems as the earlier "leftover" collection 20 More Good Vibrations—namely, more ballads ("Kiss Me, Baby"), second-rate rockers ("Hawaii"), & inexplicable MIAs ("This Whole World"). & now, as The Beach Boys' turned 50, Capitol didn't miss a beat, issuing a new boxed set, double-album, & single-album overview. While all 3 succeed to varying degrees (especially the double-album, 50 Big Ones, which, despite the fact that its allusion to the 1970s Beach Boys album 15 Big Ones, was lost on 98% of the people who bought it, was the first compilation to cover the post-1960s years adequately), our focus here is on the single-disc album, titled simply Greatest Hits. Starting with their new reunion song, the solid-if-not-stellar "That's Why God Made The Radio," its 20 songs include nearly every Top 10 hit (minus 2—"When I Grow Up (To Be A Man)," is once again the first hit voted off the island, while the #2 "Barbara Ann" is omitted, presumably because it wasn't written by them), plus essential smaller hits like "Don't Worry Baby" & the always-welcome "Do It Again." The post-'60s era is represented by a whopping 3 songs ("Rock & Roll Music" representing the '70s & "Kokomo" representing the '80s, along with the aforementioned "Radio"). & the strangest choice to make the cut is "All Summer Long," which has never charted in any form. "Barbara Ann" would have made a far better choice. & once again, things are not chronological, although this time the set ends with "Kokomo" instead of "Good Vibrations," instead of the more rewarding other-way-around. So let's get this straight—a 20-song, non-chronological hits package that omits "When I Grow Up (To Be A Man)" & "Barbara Ann" at the expense of "All Summer Long"? Sounds to me like we're back where we started: Endless Summer. & maybe that's the point. Again I will take it out & again I will listen to it, but again I will hear just as much of what it could've been as I will what it is. For all of you out there like me (& I know there are thousands of you! ), I made up my own little "extended" Endless Summer, which I feel like captures the spirit (& trackless) of the original, while then adding 9 extra bonus cuts that fill the story out. I left the original running order alone, but substituted the hit versions for the stupid versions. I grouped them in fives because I feel that it is instructional to hear them in the small sets as they were intended on the original LP configuration. Finally, I added my 9 bonus cuts, thinking of them as small sets, as though they were a third LP in the set, taking the story up the place where it should (& does) end: "Good Vibrations." So while my heart longs for "Heroes & Villains" & "Do It Again" (& yours may long for—gag!—"Kokomo"), these songs are simply not part of the same story that can be told up through "Good Vibrations." It is the story of the rise of The Beach Boys, which is to say it is the story of the rise of America's greatest rock band. Oh, & if anyone at Capitol is reading this, feel free to give me a heads up. Maybe we can reissue later this year for the 50th anniversary of "Good Vibrations"? I won this album at a dance. Wow. We played it a million times. Brought back memories.